Celebrity chef Paul Rankin is campaigning for improvements in the quality of food served to the elderly in the UK's residential care homes. Mr Rankin is calling for money spent on food in homes to be increased from an average of £18 to £28 a week and for more healthy menus to be introduced. Support groups say homes should be making better use of their budgets. The drive comes after TV chef Jamie Oliver highlighted the standard of food given to children in schools. 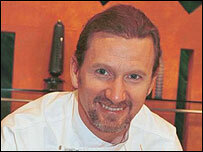 Mr Rankin is a regular face on a number of TV cooking shows and runs a restaurant business in Belfast. He was inspired to address the issue after a friend who owns a nursing home in the city asked him to help out with the catering. "The standard was not too bad," Mr Rankin told BBC News 24. "They had a cook in there cooking everything fresh but there just wasn't any real emphasis on quality tasty foods. "A lot of the food was low in fibre and nutritional content, there was too much frying going on." He said he wants care homes to move away from using convenience meals and ingredients and serve "real food". "It's an area I am particularly interested in. I think healthy food goes right across the generations. "It's just a process of education. Educating the palate, educating people as far as their health concerns are." Gillian Dalley, chief executive of the Relatives and Residents Association, said food was a source of complaint in many care homes. "An imaginative cook can do wonders with a very limited budget," she said. "On the other hand there can be a lot of waste and lack of imagination and residents get the same sort of meals churned out day after day." Shelia Scott from the National Care Homes Association said its members were already spending a average of £20-£30 a week on meals for each resident. "We really welcome the involve of people like Paul Rankin," she added. "We need assistance to ensure older peoples' nutritional needs are met but also need to talk to older people themselves to find out what it is they will eat. "Funding is only one of the challenges you face when you're trying to feed frail, vulnerable elderly people."